Scones are a favourite with camp cooks. They are quick to prepare and bake, and are ideally suited to the camp oven. Served straight out of the oven with jam and cream, or butter, they make a yummy mid-morning treat with a cuppa. I came across this recipe some time ago, and it makes a nice change from the normal plain scone, with the sweetness of dates and added flavour of orange and golden syrup. Served with just butter, or topped with golden syrup, they are delicious. A girlfriend gave me this recipe which is bit of a variation from the one above, but still using dates. A nice addition of the gingerbeer. 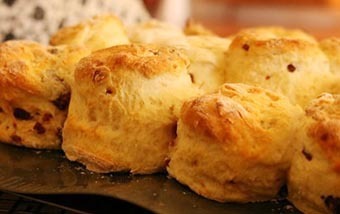 • The trick with scones is work the dough as little as possible or you will make the scone dough heavy. • The fresher the flour, the better the scone. • Sift all the dry ingredients to help aerate the flour, making lighter scones. • Mix the flour, liquid, etc. with a knife or a plastic scraper in a large mixing bowl. • Using buttermilk, sour milk (milk and vinegar) or sour cream helps lighten the mixture. Preheat oven to 200°C (or you camp oven). Prepare a baking tray and line with baking paper fir your oven or camp oven. Place the chopped dates into a bowl and pour over the boiling water. Set aside and leave to soak for 15 mins, then drain. Add the beaten eggs, orange zest, juice & vanilla and whisk to combine. Add the drained dates & cream mixture to the well in the flour and mix with a knife until just combined and it forms a soft dough. Don’t overwork the dough. See ‘Tips’. Turn the dough onto a lightly floured surface and pat to form a 2.5 to 3cm (or just over 1”) thick round shape. Now you can either use a 5cm round cookie cutter, or cut the dough into about 16 squares. Place the scones onto the prepared baking tray about 1cm apart and brush with a little milk to glaze. Bake for approx. 15 to 18 mins or until golden and well risen (timing will depend on the thickness of your scones). If using your camp place the scones in a lightly greased ovenproof dish such as an enamel dish, or foil tray, and make sure you place the baking tray on a trivet and have coals top and bottom. Baking time will depend on the heat from your coals. Served warm with topping of your choice, such as butter, cream, golden syrup, apricot jam or marmalade. They should be soft and moist. Viv’s hint: when making you could replace the cream with some plain yoghurt or a mix of cream/yoghurt. Another good alternative is buttermilk. Don’t like dates, change and use sultanas, or a mix of both. Place the chopped dates into a bowl and pour over the boiling water. Set aside and leave to soak for 15 mins, then drain well. Optional. Can just use chopped dried dates. Make sure you have plenty of coals and your camp oven is preheated and hot. Sift the flour and salt (or shake it through a sieve) into a large bowl. Add the drained chopped dates and mix. Make a well in the centre and then pour in the cream and ginger beer. Turn the dough onto a lightly floured board, flour your hands and gently mould and shape into the thickness you want. Cut scones into rounds using a scone cutter or similar to your desired size and shape. 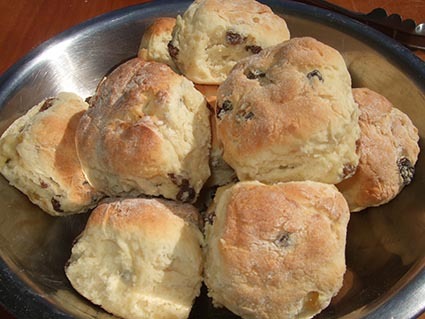 Sprinkle a little flour over the bottom of your camp oven and arrange the scone close together. If you have an old enamel deep-sided round dish that will fit the scones, lightly grease it and then place them in that, then place that on a trivet inside your preheated, HOT, camp oven. Make sure you have plenty of hot coals on top of the camp oven to help brown the scones. Alternatively arrange the scones close together on a lightly greased baking tray and bake in a very hot oven 220ºC for 10 to 12 mins or until golden.